The widespread occurrence and abundance of coal makes it the world's principal source of energy for a wide variety of end uses. Coal is a sedimentary rock of organic composition consisting of carbon, hydrogen, oxygen and minor proportions of nitrogen and sulphur. 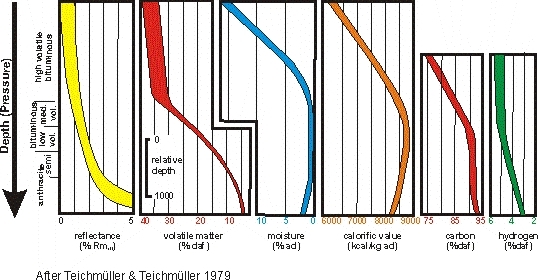 The formation of coal from various type for vegetation making the deposit and varying degrees of deposition history with respect to burial time and temperature leads to an highly variable organic material which is a present in coal as a mixture of solid components that are not necessarily chemically bound. These solid components are classified by petrographic analysis into the broad maceral groups of vitrinite, inertinite and liptinite. The natural constituents of coal can be divided into two groups: (i) the organic fraction, which can be further subdivided into microscopically identifiable macerals; and (ii) the inorganic fraction, which is commonly identified as ash subsequent to combustion. The rank (thermal maturity) of a the organic fraction of the coal is determined by the burial depth (pressure) and temperature. The composition of organic fraction changes with rank as shown below, with the main indicators of rank bring the reflectance of the vitrinite, carbon and volatile matter content on a dry ash free basis. Coal is composed of microscopically recognizable constituents, called macerals, which differ from one another in form and reflectance. Three principal maceral groups are identified and these are, in increasing order of carbon content, liptinite (exinite), vitrinite and inertinite. In a single coal, vitrinite, which is usually the commonest maceral, has a higher reflectance than the associated liptinite, but a lower reflectance than inertinite. There is, therefore, a correlation between carbon content and reflectance and this is used to precisely determine rank. The mean maximum reflectance of vitrinite in oil (Romax) as the level of organic maturity, or rank, of a coal sample. Macerals and maceral groups differ in their chemical composition and thus their technical performance characteristics. The macerals of the liptinite group contain more hydrogen and are more generally reactive than the macerals of the inertinite group, while vitrinite group macerals range between the two. the distribution of the inertinite and liptinite within vitrinite of the coal particle - a particle composed of only a pure maceral or distinctive gains of macerals will have different plastic properties (and therefore coke/ char morphology) than a particle where the inertinite and/or liptinite is distributed throughout the vitrinite. the mineral matter can play a catalytic role which will influence the decomposition of the coal and can also influence the reactivity of the resulting char or coke. Hard coking coals are a necessary input in the production of strong coke. They are evaluated based on the strength , yield of and size distribution of coke produced which is dependent on rank and plastic properties of the coal. Hard coking coals trade at a premium to other coals due to their importance in producing strong coke and as they are of limited resources. Semi-soft coking coal (SSCC) or weak coking coal is used in the coke blend, but results in a low coke quality with a possible increase in impurities. There is scope for interchangeability between thermal coal and SSCC and thus SSCC prices have a high correlation with thermal prices. Coal used for pulverised coal injection (PCI) reduces the consumption of coke per ton of pig iron as it replaces coke as a source of heat and, at high injection rates, as a reductant. PCI coal tends to trade at a premium to thermal coal depending on its ability to replace coke in the blast furnace. Thermal coals are mostly used for electricity generation. All coals can be combusted to release useful energy by the selection of suitable technology to match the coal rank and ash content. The majority of thermal coal traded internationally are fired as pulverised fuel (PF) and vary in rank from sub- bituminous to bituminous. 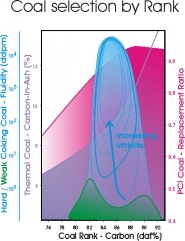 The influence of coal rank and plastic properties on the potential end use for a coal is shown in the figure below.